Home + News + What are the Requirements for Flammable Liquid Storage? What are the Requirements for Flammable Liquid Storage? Navigating the requirements for chemical handling and storage can be complex. How can you be sure that you comply with flammable liquid storage regulations and standards? When is a flammable storage cabinet required? Flammable Liquid Storage: Which Laws Apply to You? Choose a safety cabinet that has been independently tested to these standards. Third party certification from FM Approvals (FM Approved) or MPA Dresden (GS) signifies that the cabinet will perform as expected. Flammable liquid storage requirements depend on how flammable the liquid is. Because NFPA is a fire code and OSHA represents labor law, they have slightly different criteria. However, both use the liquid's flash point and boiling point as key classification elements. NFPA 30 uses two terms (flammable and combustible) in their classification of materials. Class I liquids are flammable, while Class II and III liquids are combustible. A flammable liquid is one having a flash point below 100 F (37.8 C) and having a vapor pressure not exceeding 40 lbs. per square inch absolute at 100 F; a combustible liquid is one having a flash point at or above 100 F (37.8 C). 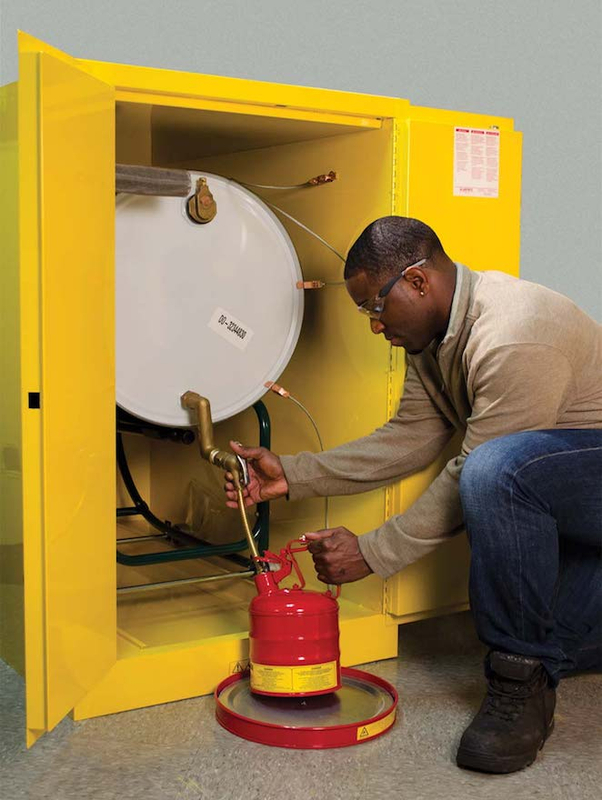 When is a Flammable Liquid Storage Cabinet Required? The OSHA standard sets volume limits on flammable chemicals based on its flammable classifications. For example, no safety cabinet is required to store less than 25 gallons of Category 1 flammable liquids in approved containers. The limit for a single storage cabinet is 60 gallons of Category 1, 2 or 3 flammable liquids, or 120 gallons of Category 4 flammable liquids. And, up to three safety cabinets are allowed in a storage area. What Can You Store in a Safety Cabinet? Justrite supplies more than 300 safety cabinet models ranging from 4- to 115-gallons (15- to 435- liters). Sure-Grip® EX Flammable Safety Cabinets keep flammable chemicals safe. Their double-wall steel structure has an air space for fire resistance. Do you need a mobile option for storing small quantities of flammable chemicals? Sure-Grip® EX Mini Flammable Safety Cabinets keep flammables for cleaning and maintenance close by. They are easily movable, placing chemicals at the point of need. For those that regularly use aerosol cans, Sure-Grip® EX Benchtop Flammable Safety Cabinets feature two roll-out shelves that can accommodate up to 24 aerosol cans. EN Flammable Safety Cabinets offer extreme fire resistance for high risk environments. They protect volatile contents for 30- to 90-minutes, depending on the model. This allows increased evacuation times. It also gives emergency responders more time to control the fire before it reaches the flammables contents. If you produce flammable waste, use Sure-Grip® EX Flammable Waste Safety Cabinets for the temporary collection and segregation of flammable liquid waste. A large FLAMMABLE WASTE warning label on the door identifies its contents. Safely store 30- to 50-gallon solvent filled drums using Sure-Grip® EX Vertical Drum Safety Cabinets. And Sure-Grip® EX Double-Duty Drum Safety Cabinets allow storage of flammable liquids contained in both drums and safety cans, in the same cabinet. Justrite flammable safety cabinets help companies comply with regulations and keep employees safe. See all our flammable liquid storage options. Great question. The answer really depends on where you’re located. In the US, for instance, some states follow International Fire Code (IFC) standards, which does require flammable cabinets to have self-closing doors. According to the International Code Council, IFC is in use or adopted in 42 states, the District of Columbia, Guam, Puerto Rico and the U.S. Virgin Islands – check the IFC Adoption Code map to see if your state is applicable. Even if you’re not located in one of those states, we recommend contacting authorities having jurisdiction (AHJ). And keep in mind, local regulations and standards change over time. Purchasing a flammable safety cabinet is generally a long-term investment. It makes sense from a best practices standpoint to buy a cabinet with self-closing doors now, so you’re sure to comply with future rules. Protect Flammable Chemicals with Self-Closing Safety Cabinets. Are flammable cabinets require to have self-closing doors? In the hierarchy of hazardous materials, flammable liquids takes precedence. Acetic acid is a flammable liquid first, and an acid second. Acetic acid should be stored in a flammable liquid safety cabinet. 1) Before placing containers into the safety cabinet, make sure they are firmly sealed and clean of residual liquid on exterior surfaces. 2) Clean up all spills immediately. Hazardous material spills are not only dangerous but can ultimately damage the cabinet. For corrosive liquid spills, make sure spills are neutralized and cleanup is performed immediately. I'd like to ask an advise, what time of flammable cabinet that can store maximum volume of acetic acid?